This game was more about the boredom question than the border question. Right now, Ireland fans are enduring the pain of hard boredom. And the fear is that there's no end in sight. International regimes do not live or die by friendly fixtures. But add this match to October's double-header here, and Ireland have gone 270 minutes at home without a goal. Or the persistent threat of one. 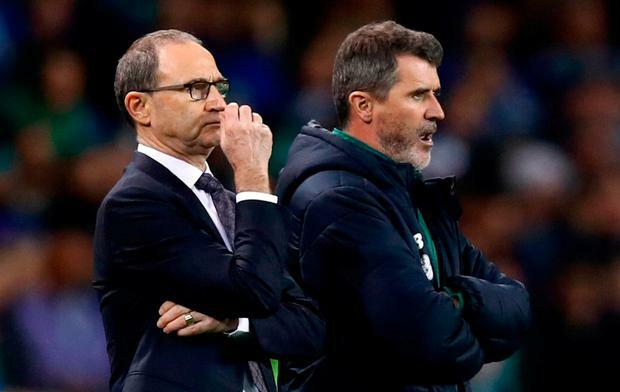 Martin O'Neill admitted at his squad announcement for this double-header that it's been a poor year and the problem is that every game is draining the encouragement levels. Only a pair of excellent Darren Randolph saves denied a Northern Ireland side working off inferior resources a victory which they would have deserved. "I thought we were in control of basically the whole game," said Michael O'Neill. "But it followed a pattern similar to our games in the Nations League where we've been dominant but not taken the chances we've created." The Republic's showing was following a similar pattern too in that they weren't creating chances at all. And there was no disguising the full-time boos from frustrated home supporters. Martin O'Neill acknowledged that those who paid in were entitled to feel short-changed. "I'm not too worried about putting in a performance for me," he said. "The disappointment would be for the supporters. They paid money there and we should do better." The full-time whistle jeers were making a more constructive point than the pre-match equivalent. At the launch of the U-21 European Championships bid earlier this month, the possibility of a return friendly between the nations in Belfast was floated. The booing of the anthems, prompted by the local reaction to the first few bars of 'God Save The Queen', has probably put that idea on the back-burner for the foreseeable future. "I'm not going to dwell on that too much," said the younger O'Neill. "I'd prefer to concentrate on football but it was a disappointing start because both teams played the game in a good spirit." 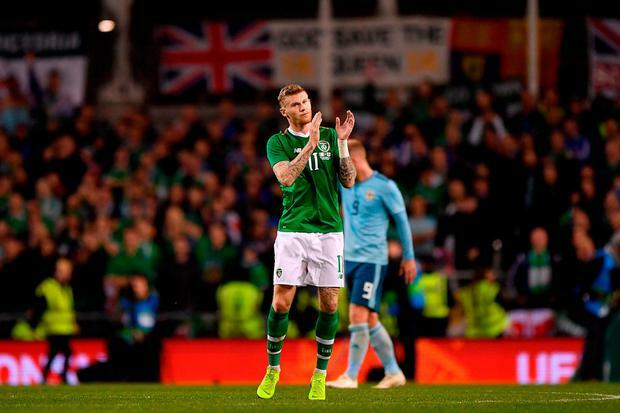 Predictably enough, James McClean was on the receiving end of grief from the boisterous travelling support who were making most of the noise. The problem for the natives is that the away charges were playing most of the football too - although that's hardly a massive compliment. His Republic counterpart did stick with a 3-5-2 system, but it was the visitors that looked more comfortable. Words from injured striker Jon Walters earlier in the day seemed prescient. "It's almost like when we are at home... We play like an away team," said Walters, speaking on the Keith Andrews Show. "So, when you do surrender possession so much, you end up picking up the ball at the edge of the box and it's sometimes difficult to watch, and it's very difficult to play in." The hope was this fixture would be different but the departing Glenn Whelan found himself pegged back deep for spells of his 35-minute farewell. O'Neill's front pair were notionally Callum O'Dowda and Callum Robinson but the former was more of a roving midfielder. Minus the ball. 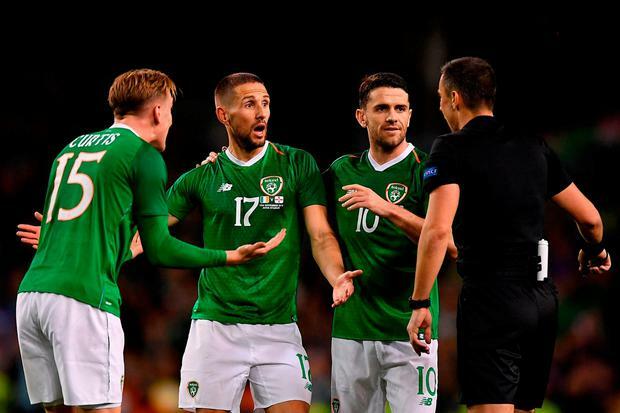 Ireland did threaten from set-pieces, yet it was their guests that created opportunities from play - albeit with the help of some dubious defending. Shane Duffy stepped out of position to set the wheels in motion for a one-on-one opportunity for Oxford's Gavin Whyte who was denied by Randolph. Darragh Lenihan, selected on the right of the back three, was caught in possession in the build-up to a wasted opportunity for Stuart Dallas. Ireland struggled to put coherent passages of play together and utilise Robinson. Slow starts are not uncommon. Ireland haven't scored a first-half goal in their eight fixtures in 2018 to date. "Well, as I said, we've lacked a goalscorer now for some time," said their manager. "We're trying to utilise what we have at this moment. I think that you're hoping in the not too distant future that we're able to rely on someone getting a goal for us. Rather than something from a set-piece." 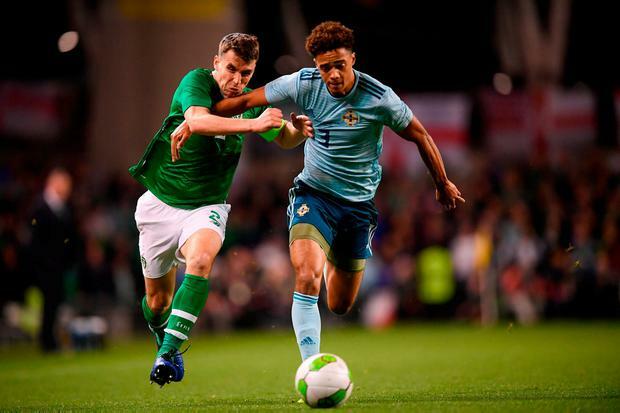 With Northern Ireland's attack featuring two League One players in the shape of Whyte and Liam Boyce, O'Neill turned to Ronan Curtis at the interval to end O'Dowda's suffering. The ex-Derry City player has thrived since joining Portsmouth in the summer. He worked hard without much joy. That comment could be applied to several others. Robbie Brady was ring-rusty and Jeff Hendrick ineffective again. Seán Maguire's outing lasted 13 minutes; another hamstring injury setback is rotten luck. And worrying too. Michael Obafemi's social media declaration of commitment did not earn him a debut, but the manager did confirm that he would travel to Denmark after a day where his agent and then the player made it clear there was no doubt around his longer-term intentions. "It was really up to him," said O'Neill. "He's been really well received by the players and the staff here and that played a big part in his decision. "He's certainly got promise. Naturally we are pleased he's committed himself. He's obviously got work to do. Maybe in the not too distant future he could be a proper player for us. It's asking a lot for him to step in and be the answer to the goalscoring problems." Ireland's issues run deeper, even though O'Neill believes that the 3-5-2 system has tightened up defensive problems. He pointed to the fact that the clear-cut Northern Irish opportunities came from errors. It was the nervy Lenihan who gifted visiting sub Jordan Jones a gilt-edged chance to secure the win but he was denied by Randolph. Maybe the result didn't matter too much. But this performance told its own story. Daniel McDonnell MICK MCCARTHY says that the uncertainty around Irish football should have no impact on him or his players.